I just love the juxtaposition of elegant and formal with primitive and rough. 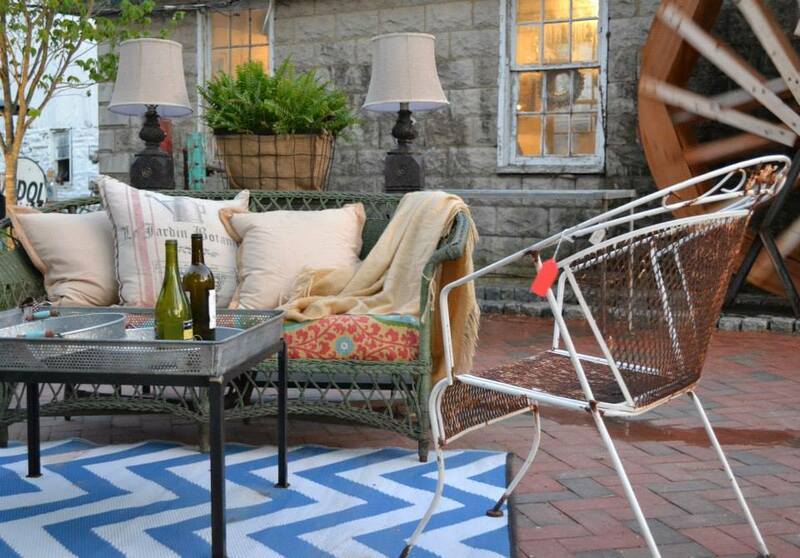 Try a great outdoor fabric in a bold stripe to make your patio sparkle. Don’t forget how you’re going to serve food and drink on your patio. 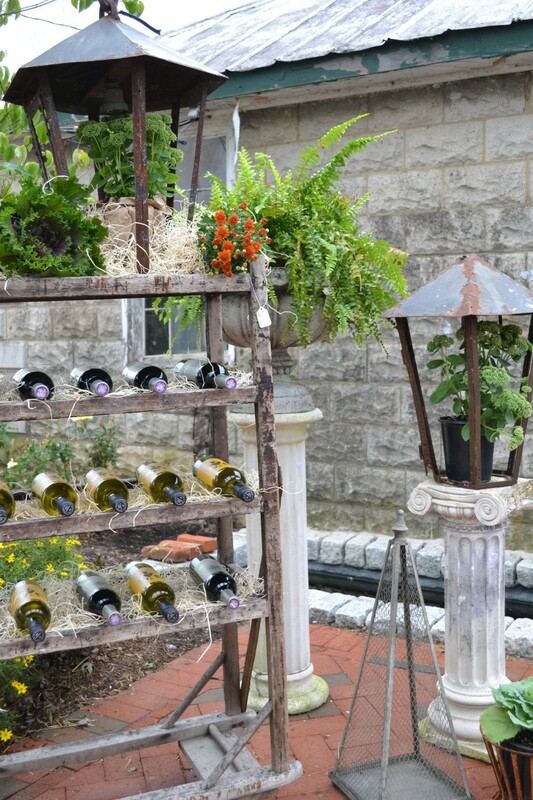 This shoe rack is just perfect for wine! 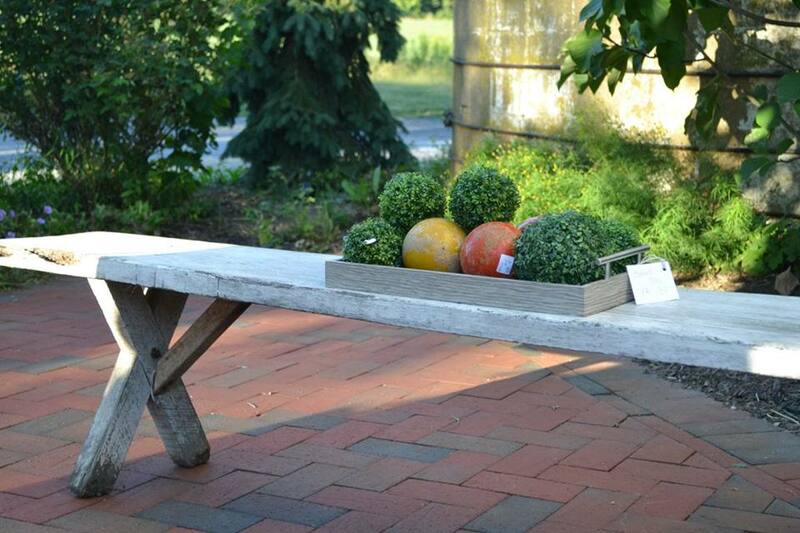 Outdoors is a great place to utilize unexpected pieces in useful ways. 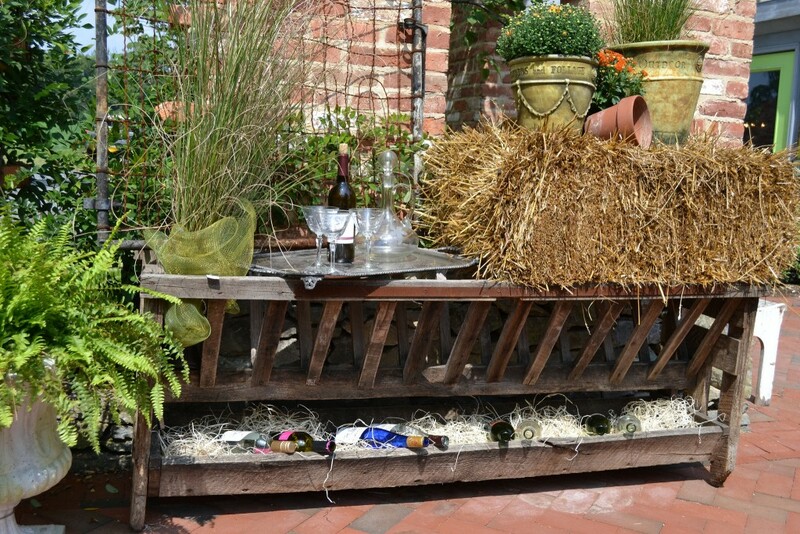 This large manger is perfect as a server for your outdoor gatherings. 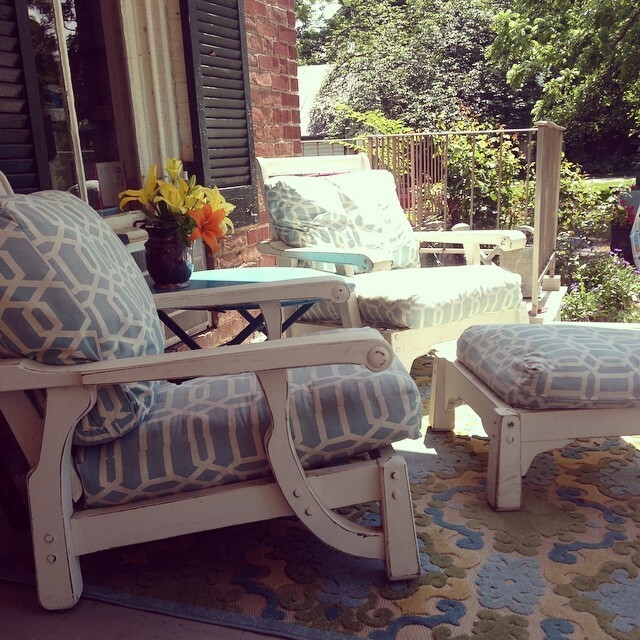 Be sure to make your outdoor rooms as comfortable as your indoor ones. This wicker lounge is just calling you to bring a book and relax. 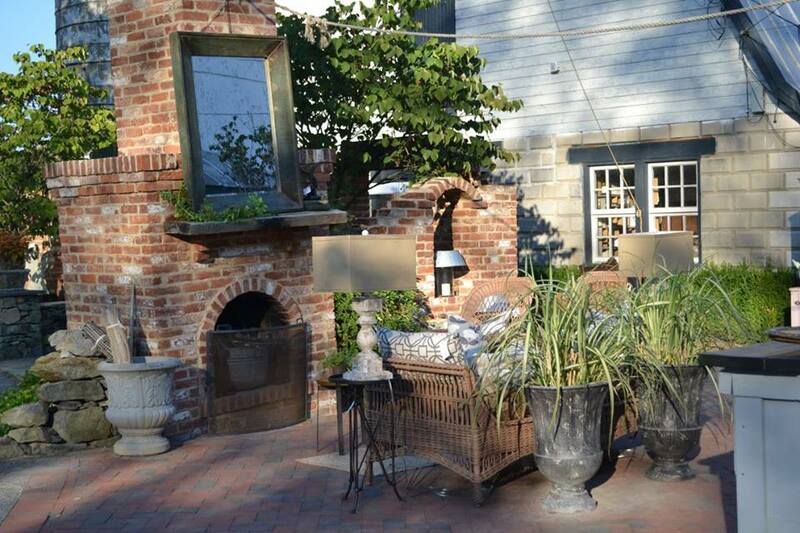 Also, don’t forget your lighting for your evenings outdoors. 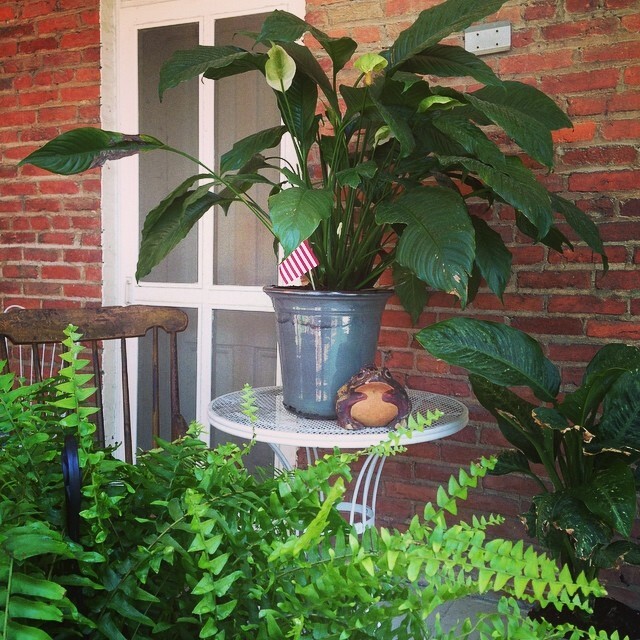 Use your plants as room dividers. In these great urns, they look fabulous, too. Simple benches make great extra seating. Mix metals and woods for an eclectic look. Don’t skimp on the pillows and throws! 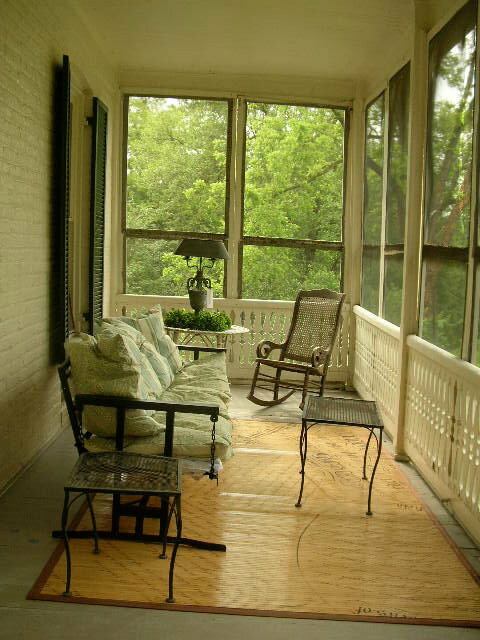 Here’s a full view of our upper, screened porch. 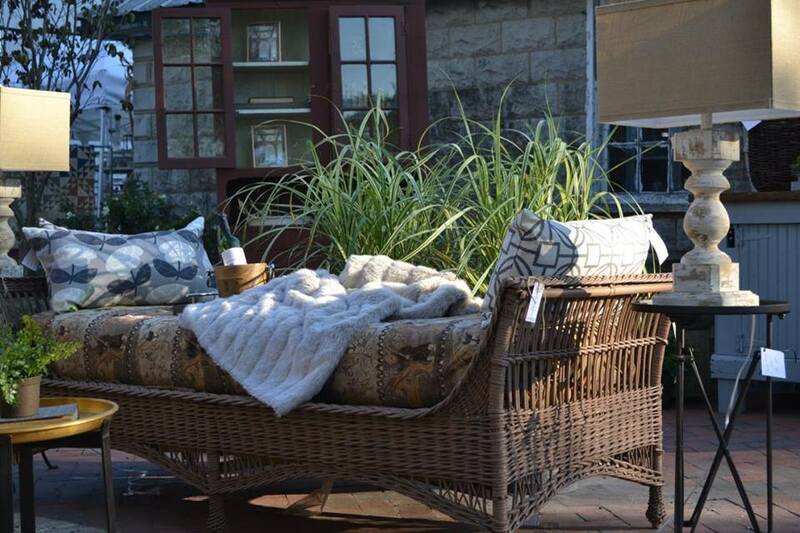 That’s a vintage glider I painted black, and filled with down pillows, covered in outdoor fabric. The rocking chair is from my great aunt. The side tables are from my grandmother. She used them on the back terrace (which we find just too hot in the summer; it has no shade). 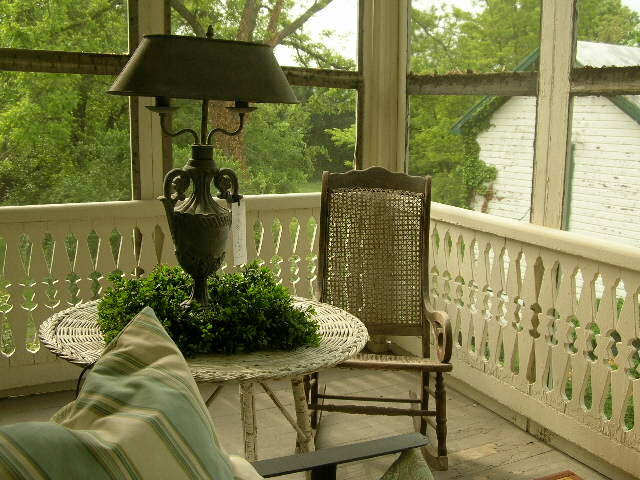 Here’s the view of our little cottage from the second story, screened porch. 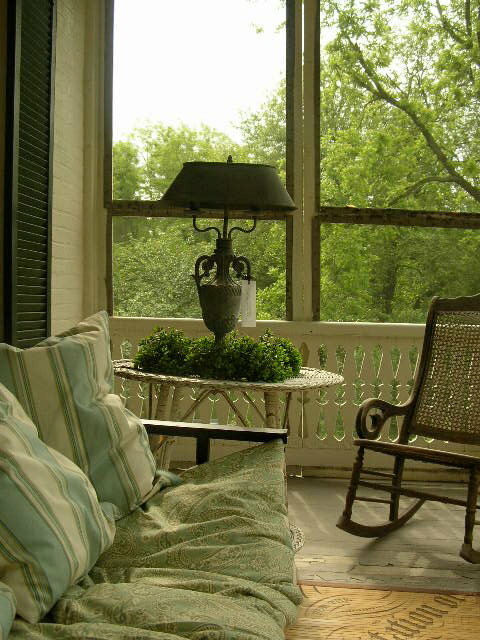 We call it The Sleeping Porch. When my father was a boy, they would all sleep out here in the summer. He swears they slept out here even in the winter, and he’d wake up with drifts of snow on his covers. It’s much nicer here in the spring, don’t you think? The lush, green view over our water garden into our yard. 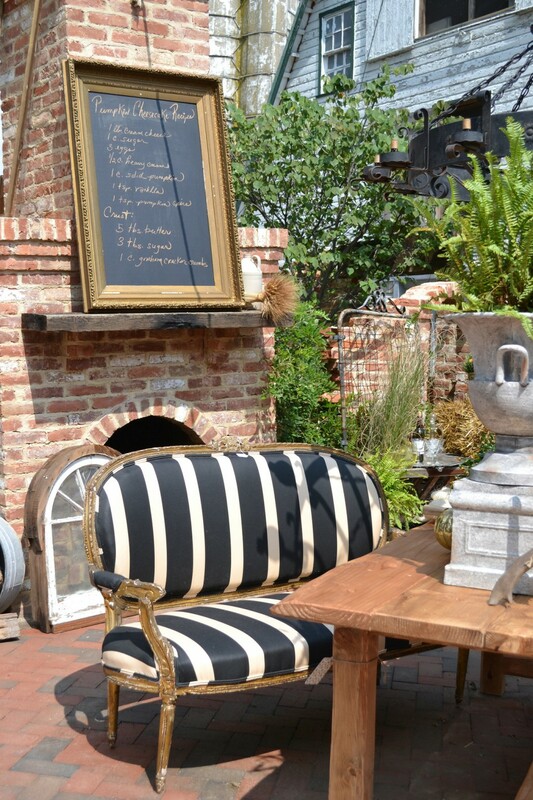 I just love these wrought-iron, Italian garden chairs. They’re pretty, comfortable, and create a fabulous spot for sipping a cocktail in the evening. Just look at how that branch has stretched horizontally, all the way across the yard, in search of sun. I love how it creates a huge, natural frame for my view. Absolutely our FAVORITE fair-weather spot. We got these fabulous vintage chairs and ottoman at the Chartreuse & co Spring Market Days, 2015. They are sooo comfortable. The carpet pulls it all together – we got that from Woven Floors, on the second floor of the Main Barn here at Chartreuse & co. Chip and I begin and end every decent day (and some not-so-decent, too!) right here. This picture is from last year, and it was my experiment with calla lilies. I’ve decided to go back to palms this year. I like their height and their featheriness better. And, let’s face it: no discussion of outdoor space would be complete without a nod to The English Garden. 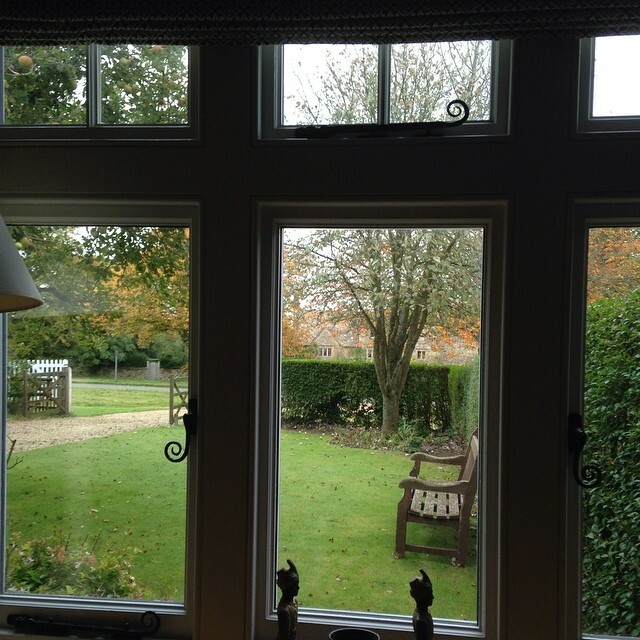 Here’s a shot from our home-away-from-home in the Cotswolds. 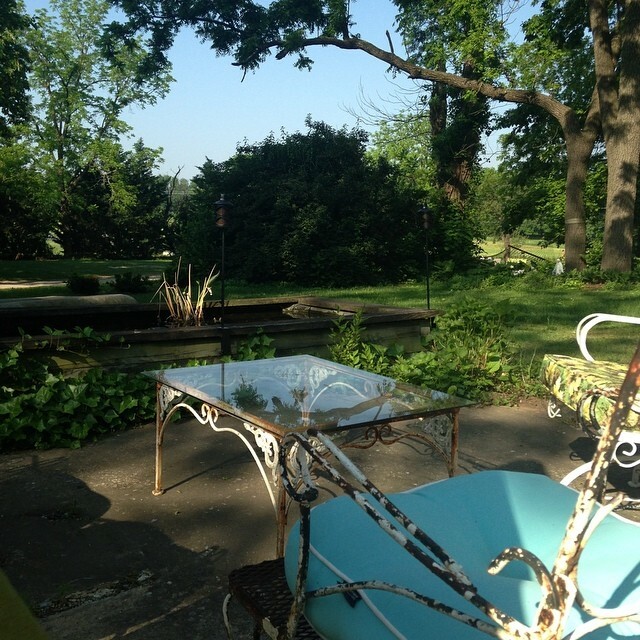 I hope this little shot of outdoor living has inspired you!